A few months back, there was a flurry of cool fan art based on this interesting theme, I wish I had saved them and organized them. That Boney is a spy! Lucas: “C’mon boy! fetch the stick!” Chimera Boney:”ROAR!!!!!!!!!! !” *stick explodes in jaws* Lucas:”Good boy! Now fetch the Pigmask. fetch!” Chimera Boney:”WOOF!!!! !” *mutilates Pigmask* Lucas: “GOOD BOY! It looks like a RABID TERRIOR!! Actually, back when the very first teaser screenshots of the GBA version of M3 came out, I was sure that something horrible would happen to Boney involving him being experimented upon, and even went as far as to predict that the Lucas family party would be forced to put down a mutated monster Boney via a boss battle. Considering there was zero plot info available then, that was a pretty good freaking guess if you ask me. Adorable. I just wanna give it a big hug! Heh, I’d like to see the bouncers stop THAT from entering Club Titiboo. Ultimate Friend… or Ultimate Enemy? Man, Boney’s been hittin’ the gym. Yeah, that WOULD’VE been an interesting story piece! 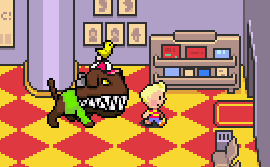 I mean, Boney’s great and all, but he’s really a pretty unimportant character. That is cute! I would love Ultimate Chimera as a pet… All I have is a border terrier that is either really hyper or really lazy.